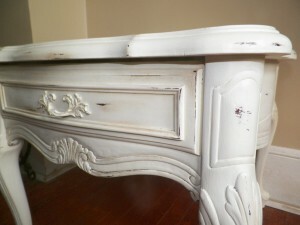 I recently finished an end table using Annie Sloans Old White paint and have some pics for you. This table has a real French Country style with a lot of details, brought to life with some dark wax and distressing. You can really see the details now, more so then before when it was just stained.